Guest Post! Big Thanks to my friend Angie Vee for writing our post today! Enjoy! Black Friday was particularly vile this year. There, I said it. Black Friday is the adversary to good will; the thief of joy and holiday cheer. All across America on this day, shopping centers are transformed into a kerfuffle of terror reminiscent of Germanic folklore’s ultra-gory Krampuslauf. Turning on the TV, I can hardly tell the difference between video feed of otherwise good neighbors behaving badly at local big box stores or scenes from George A. Romero’s 1978 zombie massacre, Dawn of the Dead. This meme says it all. Well, count me out. 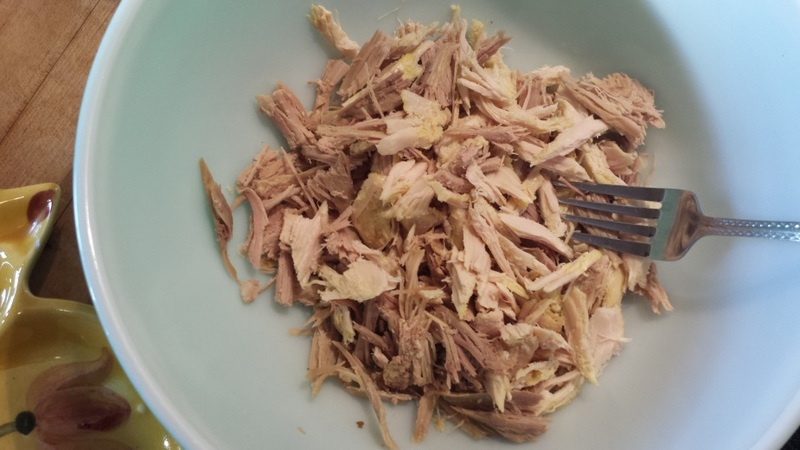 Alternatively, a few years ago my Hubbins and I decided to start a new post-Thanksgiving tradition – leftover turkey dinner for breakfast, only crispy and fried! That’s right. CRISPY! And, FRIED! You see, the British do this wonderfully bizarre thing with their leftovers called Bubble & Squeak. Sounds adorable, right? 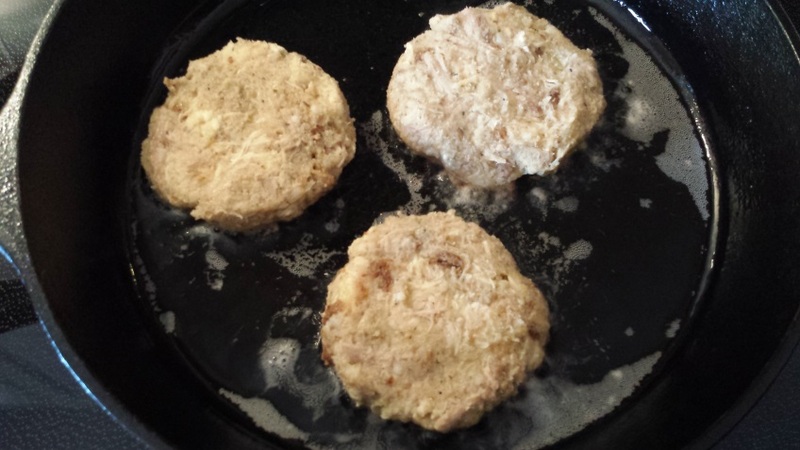 They toss the leftover ingredients from last night’s roast into a mixing bowl, mash them together like a meatloaf mix, form little croquettes, and then shallow fry ‘em up for breakfast the next morning. 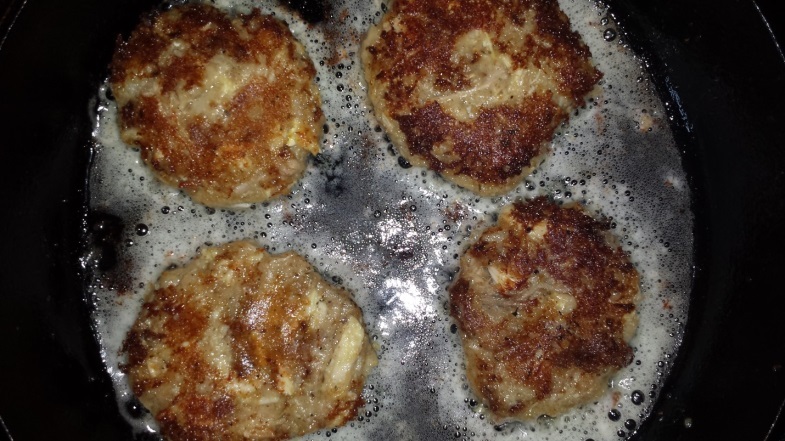 It’s called bubble & squeak because – you guessed it – the croquettes actually bubble and squeak in the frying pan. (Those Brits are so clever.) Usually, the mishmash is loaded with whatever leftover potatoes, cabbage, veggies, etc. are on hand. Now, apply the same process to your Thanksgiving leftovers. First, shred the turkey and chop the veggies. Then, toss some turkey to the cat. Dusting each croquette with flour or bread crumbs prior to frying is optional because they turn will out delicious either way. The important part is that they are browned and crispy on all sides. Shallow fry, approx. 4-6 min per side. Finally, we top the patties of fried goodness with leftover gravy, cranberry sauce, or creamed corn. There, now you have it. 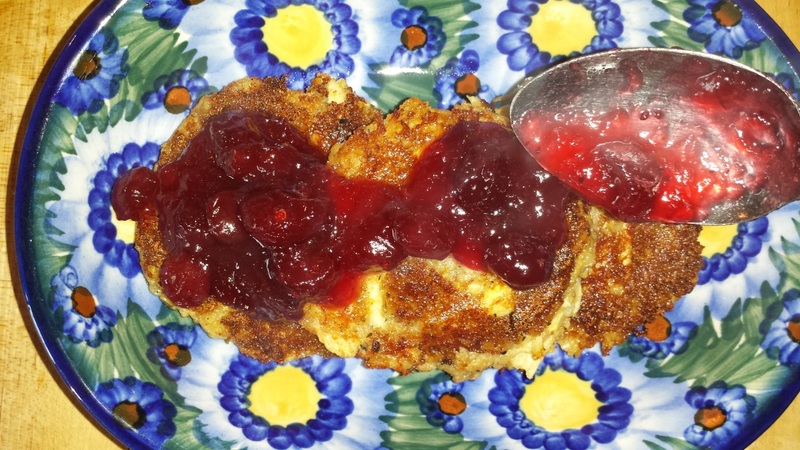 Thanksgiving leftovers, the bubble & squeak edition! I. Am. Tired. Of. Turkey. Please don’t misunderstand – I love a classic American Thanksgiving dinner of turkey, stuffing, potatoes, cranberries, and (way too much) pie. I enjoyed exactly this meal with gusto a few days ago. I enjoyed my leftovers. I sort of enjoyed my leftovers of leftovers. But seriously, folks, it’s time to move on… far and away to visit entirely new flavor combinations. For dinner tonight, Crowded Earth Kitchen is drawing inspiration from India. My favorite Indian take-out restaurant meal is Mushroom Matter, sometimes called Mutter or Matar. 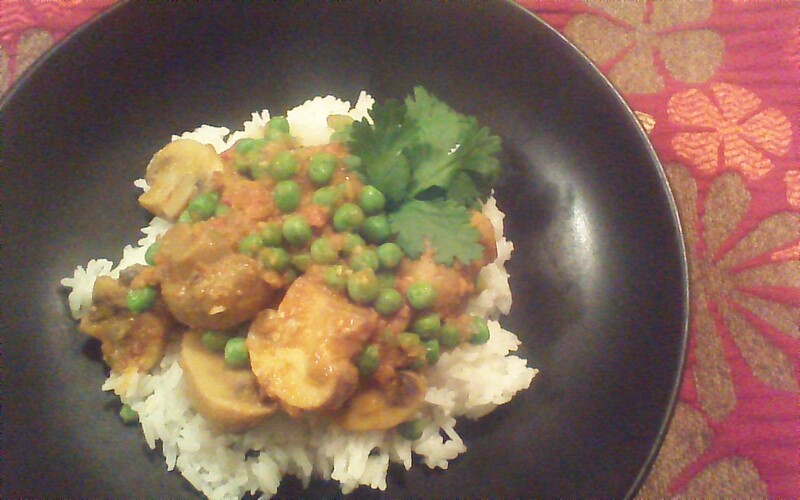 This meal is often described as “mushrooms and peas in curry sauce.” The problem is, the word curry is about as specific as the word soup. Curry isn’t a dish, it’s an entire food category. For this German-American cook, creating a delicious curry sauce to coat nutritious mushrooms and peas was a fun challenge. This particular curry is made from easy to find ingredients, and has enough kick to be interesting, without scaring a curry novice away. Go ahead and put that leftover turkey in the freezer! Step 1) Make the paste which will serve as the base of your curry. To do this, combine tomato, onion, ginger, garlic, almonds, and 1/3 cup water in a sauté pan (see above). Cover and simmer over low heat for 10 minutes, until all ingredients are cooked and softened. 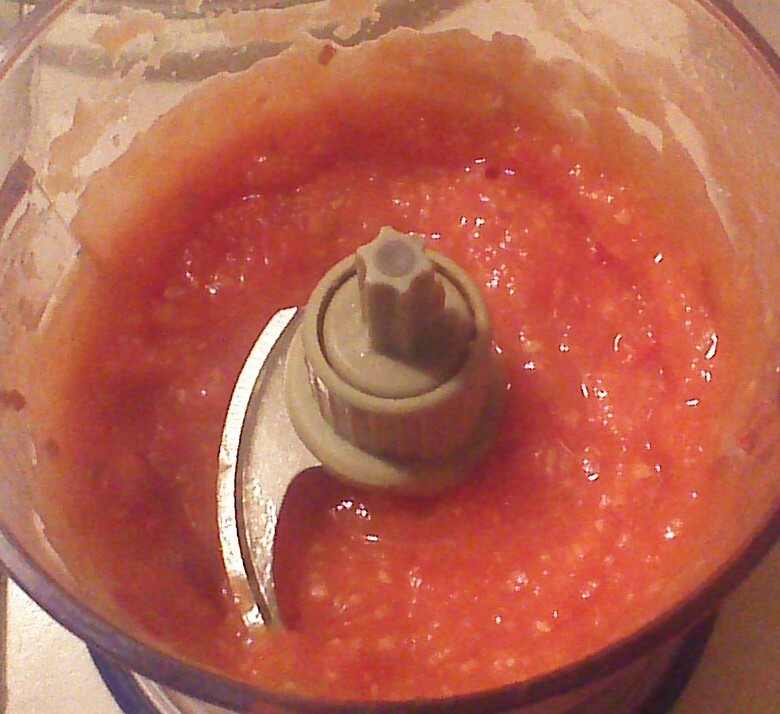 Cool, then puree in a blender or food processor. Set aside. Step 2) Add olive oil to the sauté pan and heat over a medium flame. Add cumin, chili powder, coriander, turmeric, cinnamon, black pepper, and cardamom. Fry spices in olive oil for one minute with constant stirring. Add peanut butter and stir for one more minute. Step 3) Add paste from step 1 back to the pan. Add mushrooms and two tablespoons of water. 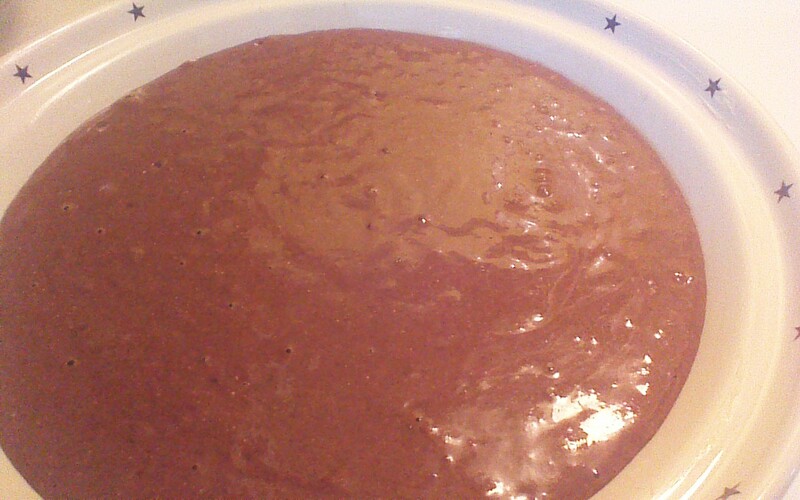 Stir and simmer, covered, for 15 minutes. Stir occasionally to prevent sticking, but keep the pan covered as much as possible. The mushrooms will cook down and release their liquid into the curry. Step 4) After 15 minutes, add frozen peas to the pan. 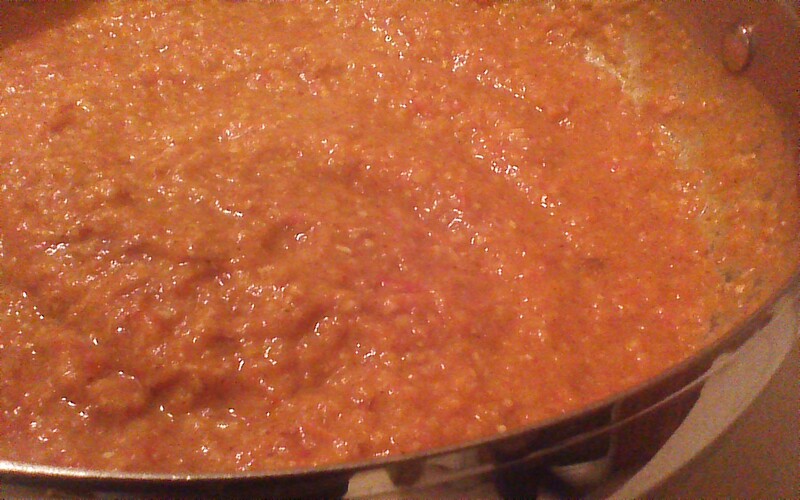 If the curry seems too thick (it should be a sauce at this point, not a paste), add a little bit of water. Cover and simmer for 5 minutes, until peas are hot. Step 5) Serve over cooked Basmati rice and garnish with fresh cilantro. You may certainly use regular brown or white rice if you wish, but Basmati rice offers an enticing popcorn aroma and unique taste that is just wonderful with Indian Mushroom Matter. Enjoy! My amazing Grandmother left this world yesterday. She was a wonderful artist, an enthusiastic collector of curiosities, and loved her family fiercely. She was an excellent cook, and was happy to feed any and all who found their way to her kitchen table. She wasted nothing, and could conjure a meal for a crowd out of just about any unlikely combination of ingredients found in her pantry. I aspire to someday cook as well as my Grandmother. Today I’m sharing a recipe for Beef Rouladen, a German dish and beloved comfort food that Grandma made. I’m working from memory, and may have inadvertently taken a few liberties with her exact recipe, but this is how I remember the dish. Enjoy, and celebrate your loved ones this Thanksgiving. I certainly am. Step 1) Trim round steak into 8 rectangular pieces, each approximately 6 or 7 inches long and 3 or 4 inches wide. Step 2) Lay a half piece of bacon on top of each piece of round steak. 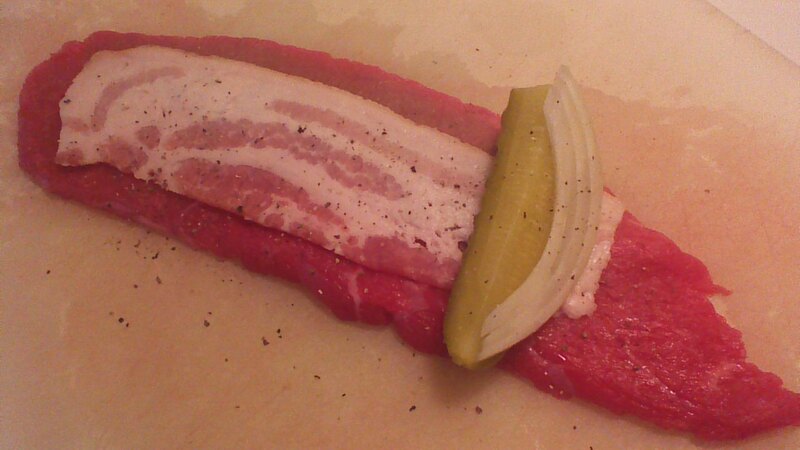 Place a pickle spear and a few onion slices crosswise near one end of the steak, as shown above. Sprinkle with freshly ground black pepper. 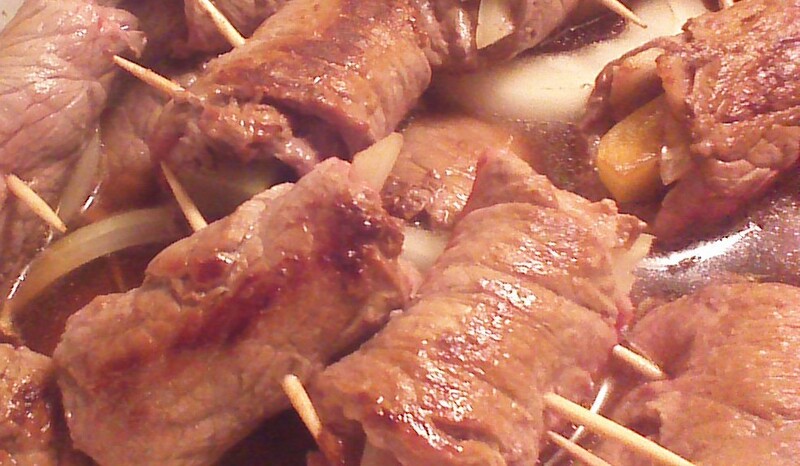 Step 3) Beginning at the end nearest the pickle and onion, roll each piece of steak as you would roll up a sleeping bag. Secure each roll with two toothpicks. 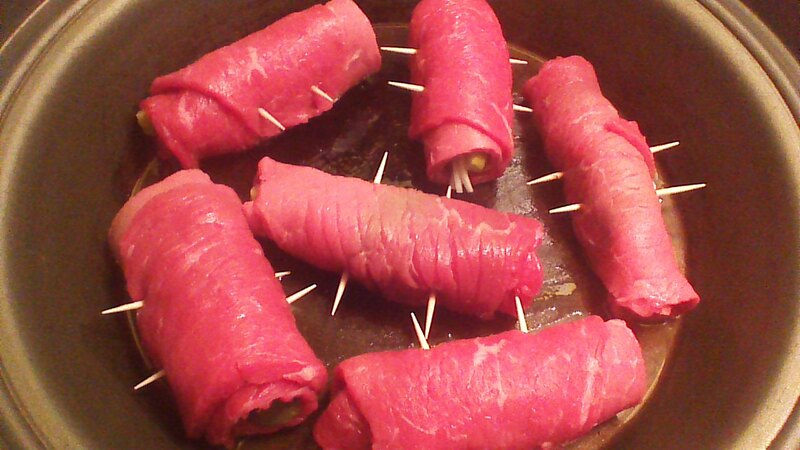 Step 4) Brown the rolls in a nonstick pan over medium heat. This will take about 3 minutes per side (“sides” being above and below the toothpicks, as shown). 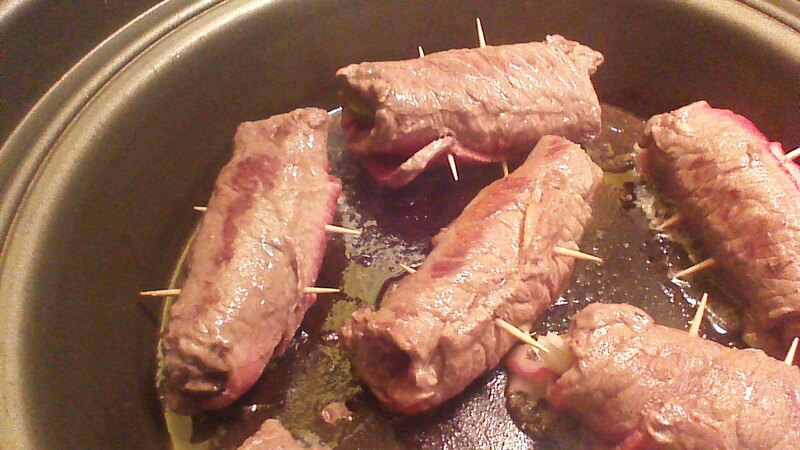 Step 5) Place browned rolls in a crock pot, and cover with beef stock. Slow cook on “low” for 5 – 6 hours. 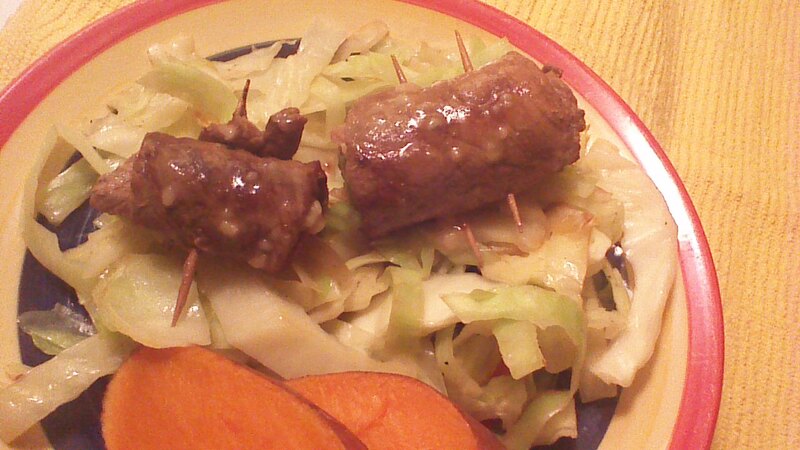 Serve with cabbage and yams as shown, or enjoy with spaetzle. This dish takes a little while to prepare, but the effort is worth it! If you happen to be vegan, or are hoping to impress your vegan dinner date, than this dish is for you! The sweet and crunchy, high protein pecan crust is layered with colorful, savory root vegetables and topped with a sprinkling of balsamic dressed greens. What’s not to love? Step 1) Combine finely chopped pecans, vegan butter substitute, whole wheat flour, and brown sugar in a medium size mixing bowl. 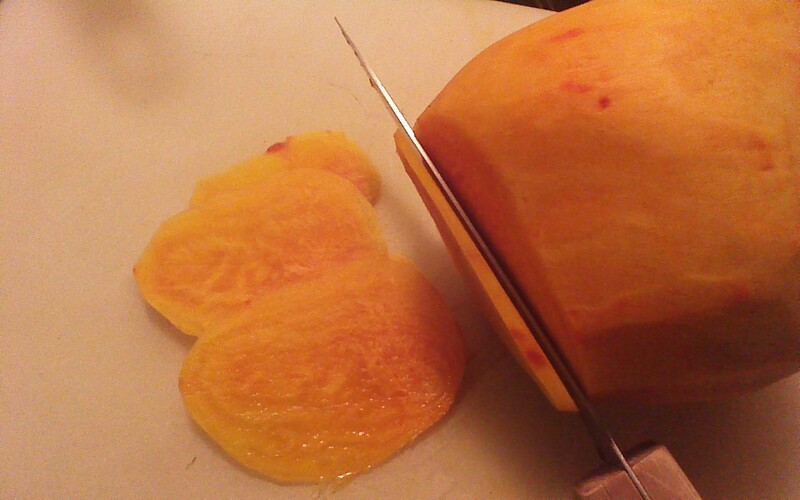 Cut together using a pastry cutter (shown) or using two forks (held side by side in one hand, as a “homemade” pastry cutter). When you are finished, the butter should be cut into tiny pieces smaller than peas, and should be evenly distributed. 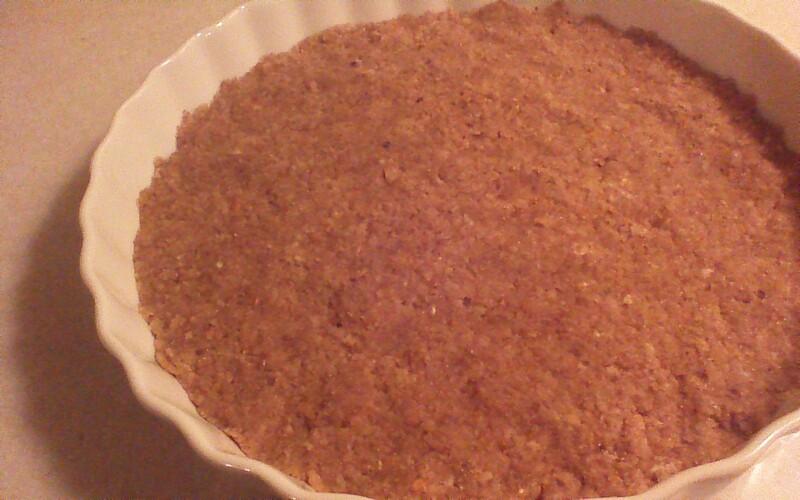 Step 2) Press the pecan mixture into the bottom of a 9 inch tart pan (a pie dish would also work fine). Bake in a preheated 350 degree oven for 12 minutes. Remove from oven and set aside. 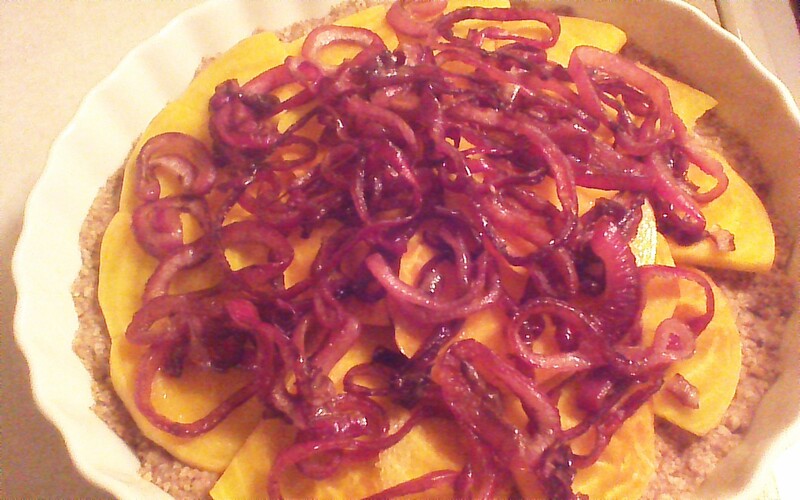 Step 3) While crust bakes, begin caramelizing onions. 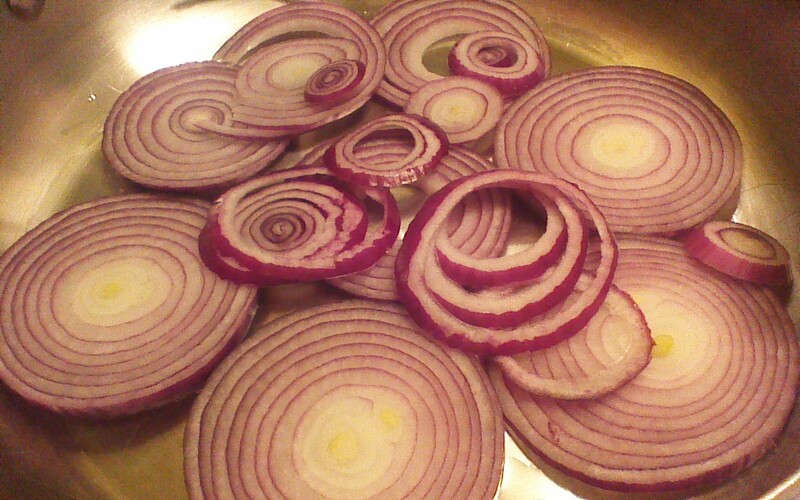 Cook sliced onions in olive oil for 10 minutes, stirring frequently. After 10 minutes, add 1/4 teaspoon salt and 1/4 teaspoon sugar, stirring frequently. If onions begin to stick, add 1 tablespoon of water and stir. Continue cooking over low heat until onions are soft and take on a caramel color. Add balsamic vinegar to pan, and immediately remove from heat. Step 4) Combine lemon juice and 2 tablespoons sugar in a shallow bowl. Dip very thin slices of yellow beet in the sweetened lemon juice, shake off excess juice, and set on a towel to dry slightly. Step 5) Assemble tart. 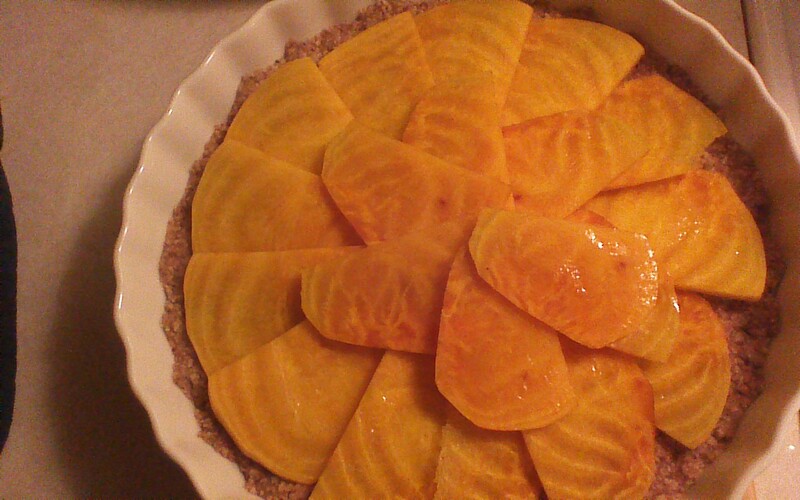 First, layer towel-dried beet slices over the pecan crust, as shown. [It’s important that your beet slices aren’t wet, or your crust won’t be crunchy!] 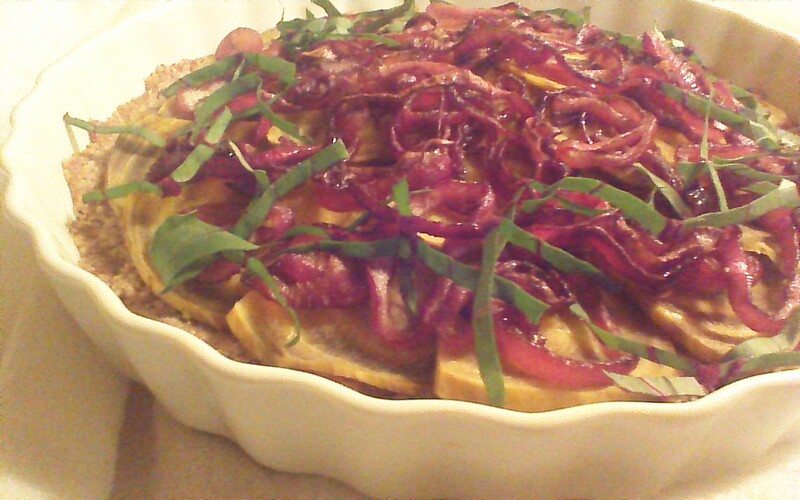 Second, Arrange caramelized onions over beets. Do not discard the vinegar in the sauté pan – we’ll use that in a few minutes! Step 6) Bake tart in a preheated 350 degree oven for 10 minutes. Step 7) During the last two minutes of baking, add thin slices of beet greens to the (cooled) sauté pan coated in balsamic vinegar. If the pan is dry, add an additional tablespoon of balsamic vinegar. Without heat, simply stir the greens around a bit to pick up the flavors of the balsamic vinegar and the caramelized onions. Step 8) Remove tart from the oven, garnish with greens, and carefully cut into wedges with a sharp knife. Bon Appetit! I can’t in all good faith call this a “recipe.” It’s a simple serving suggestion, but a darn good one to use for that appetizer you told your boss/neighbor/Aunt Mildred that you would bring to the meeting/block party/bridge club, and then forgot ALL about. 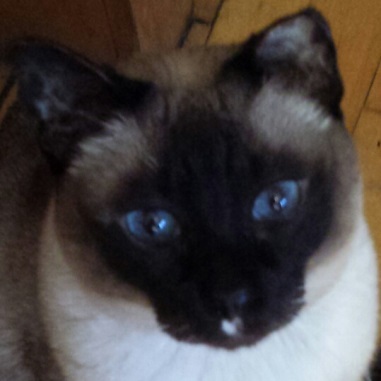 If you have ten minutes and opposable thumbs, you’ve got this! 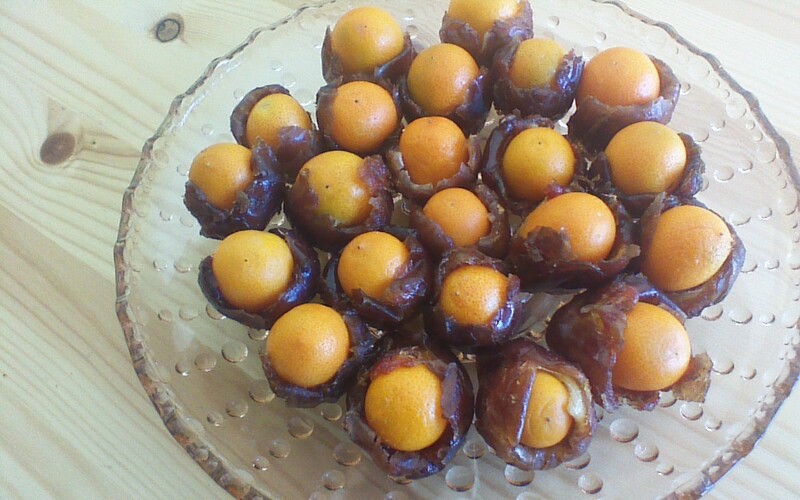 In case you’ve never tried them, kumquats are delightful little grape-size citrus fruits. Just pop one in your mouth for an amazing burst of flavor reminiscent of a tart orange. Tuck one into a sweet date, and the flavor combination will make you smile. 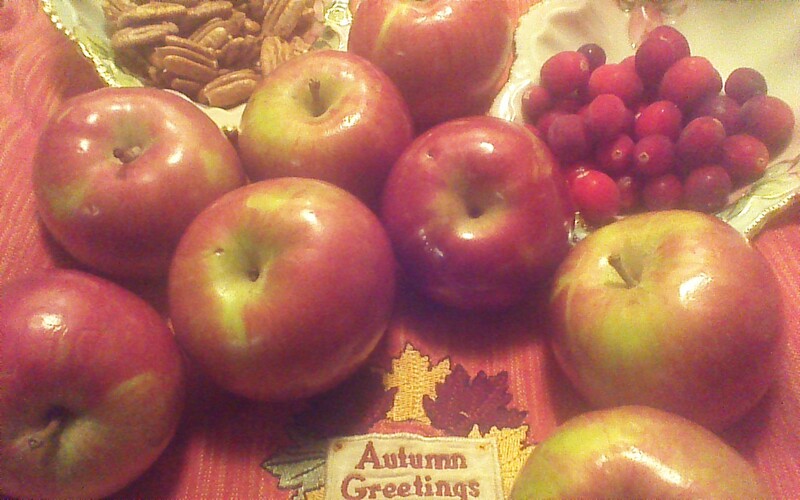 They are in season right now – give them a try! 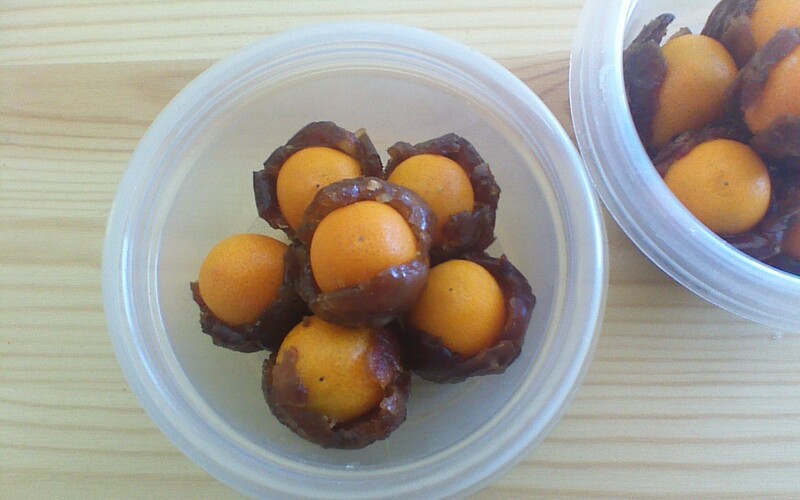 Gently open each date and tuck a kumquat inside. 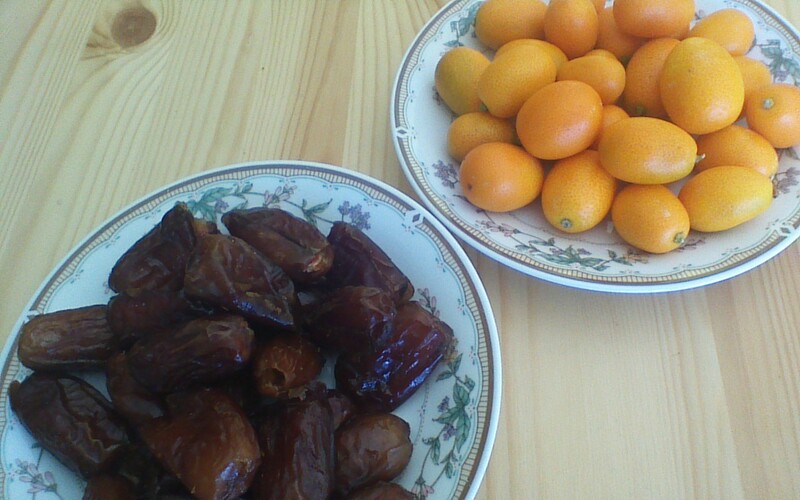 Dates are sticky, so the easiest approach is to pull each date almost in half, and then mold the date back around the kumquat with your fingers. Easy peasy. Arrange on a serving plate, or tuck them by the half dozen into small storage containers (shown left) for unique lunchbox treats. Here at Crowded Earth Kitchen, we love sampling foods and enjoying food related stories from the far reaches of the world. If you want pie, we invite you to come and visit our speck of earth, the American Midwest. The old saying “as American as mom and apple pie” conjures up images of a simple life, picking apples on the prairies and plains of America’s heartland and baking them into fresh pastries with your apron-clad mother or grandmother. As much as I hate clichés, I live in the Midwest, own two aprons (one of which belonged to my Great-Grandma), and take good care of my apple trees. Do with that what you will. This recipe for Thanksgiving Pie merges an American favorite with an American holiday – the Thanksgiving holiday. Celebrated every year on the last Thursday of November, Thanksgiving remembers harvest dinners shared by pilgrims arriving from Europe and the Native American people who kept those pilgrims alive through their first winter in the New World. The history is tainted by the fact that this kindness was not reciprocated later, but the holiday is still observed with a modern approach of generally being thankful for our blessings now. For many Americans, it’s a lovely day involving a lovely meal. This pie blends three autumn harvest flavors… apples, cranberries, pecans… and reminds me of Thanksgiving all year ’round. I hope you enjoy! 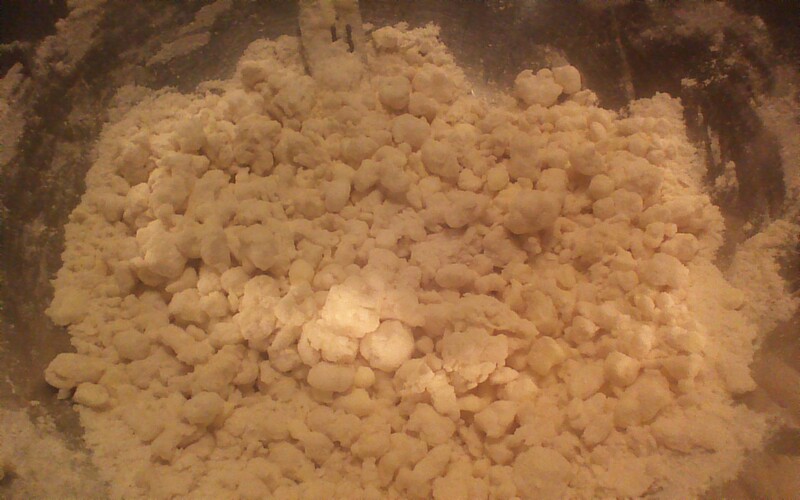 Step 1) Combine 1 1/4 cup flour, salt, and allspice in a small mixing bowl. Add cold butter. 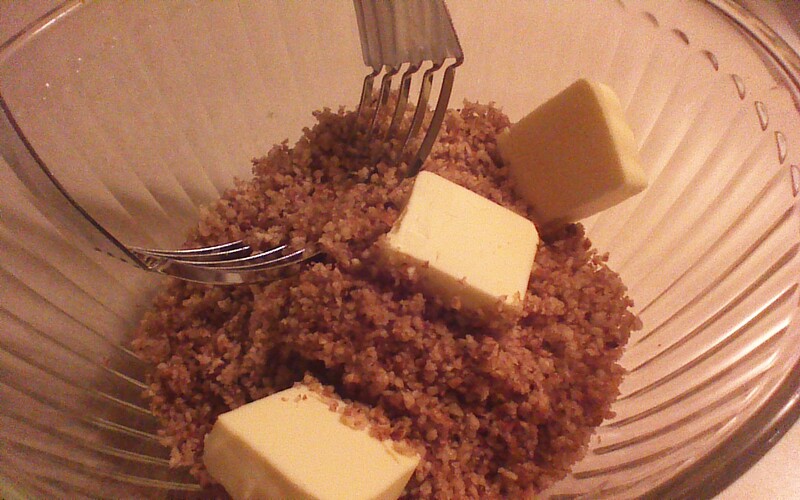 Cut butter into flour mixture using a pastry cutter, until mixture resembles a bowl of pea-size crumbs. Step 2) Sprinkle water and vodka over butter mixture, 1 tablespoon at a time. Don’t dump the liquid all in one place! 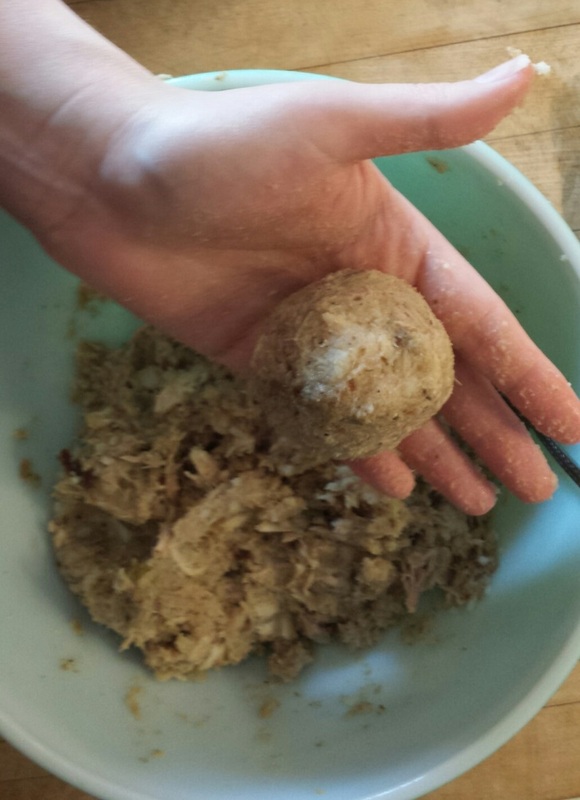 Gently incorporate until a ball of dough forms. If you need to use your hands, that’s fine. 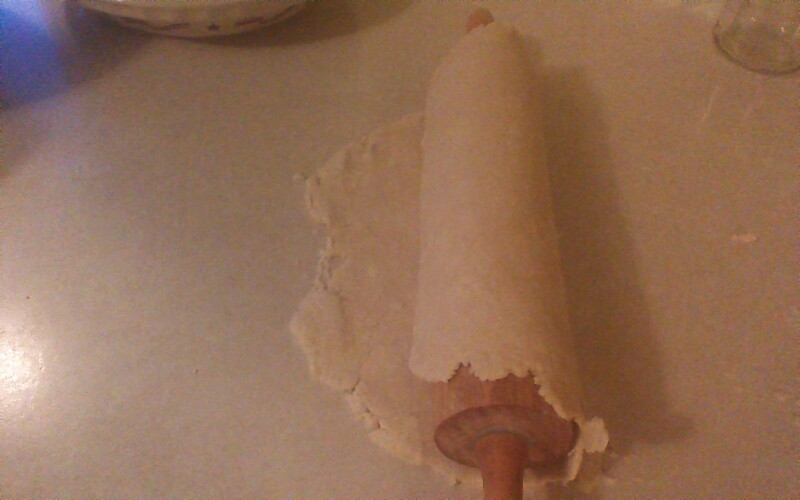 Step 3) Roll dough on a lightly floured countertop using a lightly floured rolling pin until the dough is approximately a 12 inch circle. It doesn’t have to be a perfect circle, no matter what some cookbooks tell you (we’ll fix it later, don’t worry). Step 5) This is why we don’t care if the crust is a perfect circle… use a small knife to slice off all of the dough that hangs past the edges of your pan! We’ll make it look all fancy in a moment, but for now, we just want the dough even with the edges. Step 6) Using a tiny cookie cutter or other mold, cut tiny shapes (approximately 1 square inch) from the dough scraps. Set shapes aside. 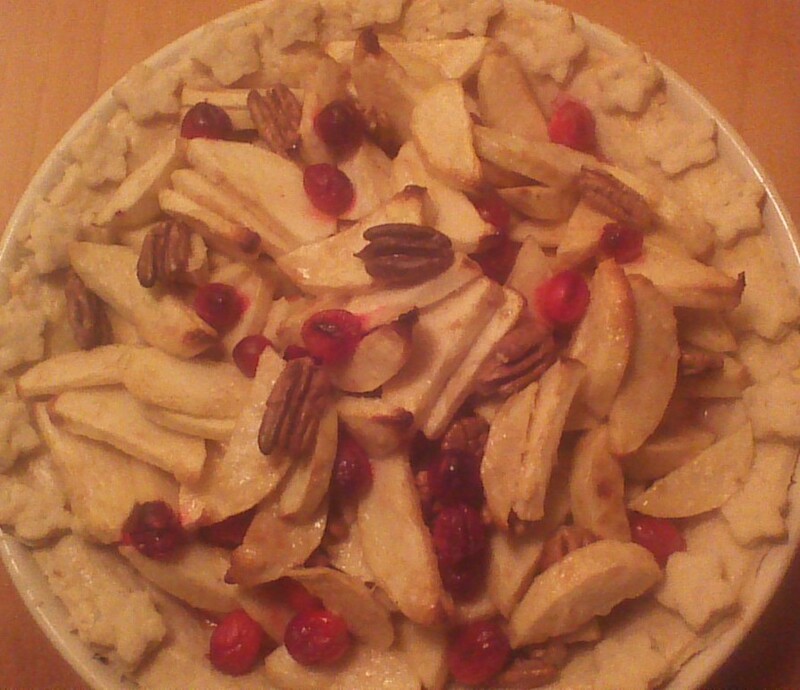 Step 7) Cover your pie crust with a towel, and make your filling… Combine your apple slices, cranberries, pecans, sugar, 2 tablespoons flour, cinnamon, and cardamom in a large bowl. 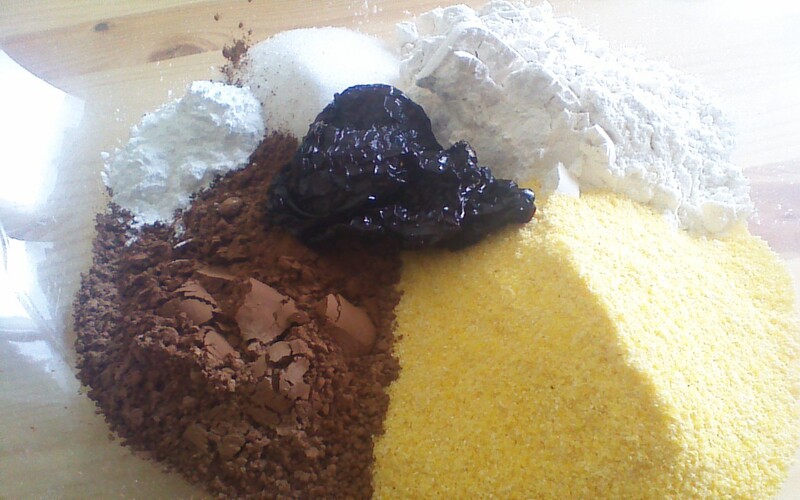 Mix gently until ingredients are combined. 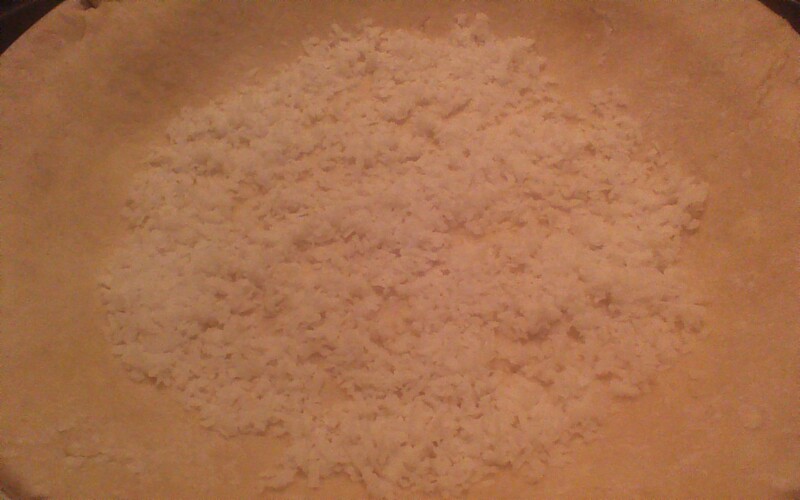 Step 8) Sprinkle the bottom of your pie crust with shredded coconut. This is entirely optional, and you really won’t taste the coconut. This steps helps to absorb excess liquid from the pie filling. 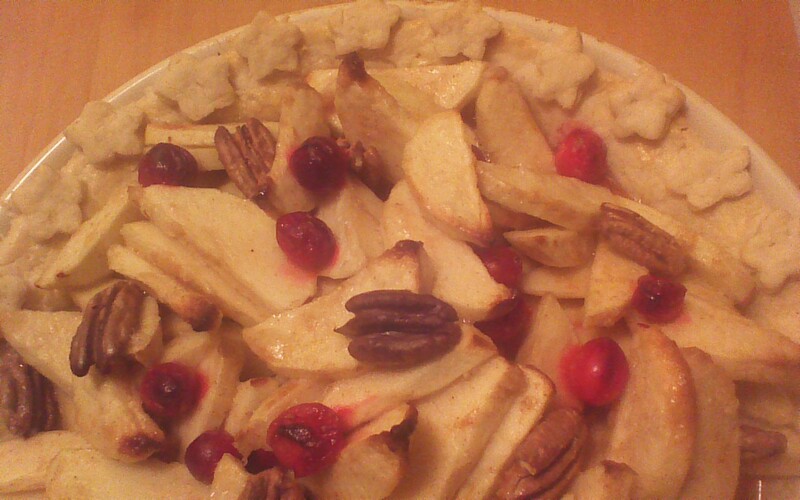 If you don’t like coconut, try sprinkling the bottom of your pie crust with finely ground pecans. Step 9) Pour your filling into your pie pan. Isn’t it pretty? Step 10) Brush beaten egg around the top edge of your pie crust, and stick on the little dough shapes you cut a few minutes ago. Just work with what you have, and try to space your little dough shapes evenly. 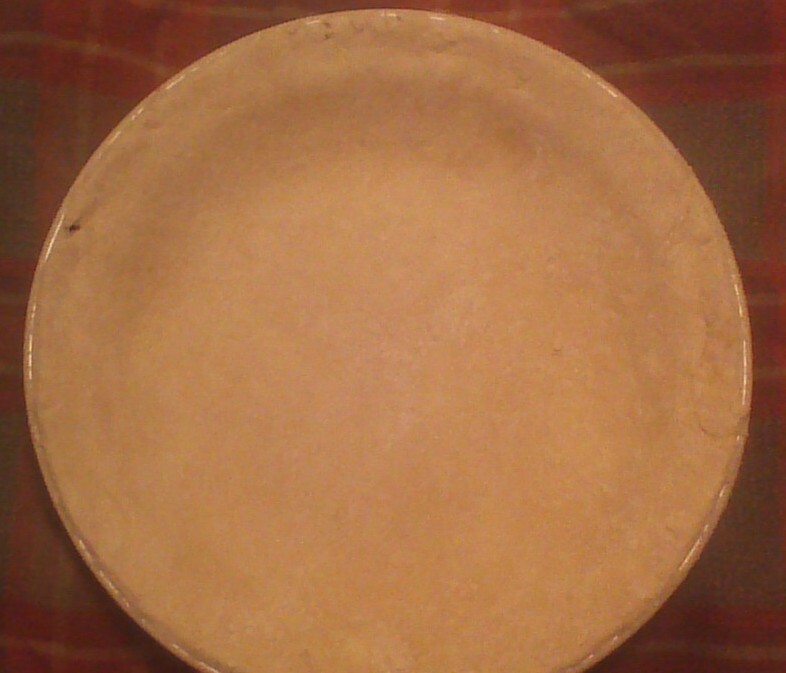 There, look at that lovely pie crust! No perfect circle required. Step 11) Bake your pie on a low rack in a preheated 375 degree oven for 45 minutes. Let cool and enjoy! 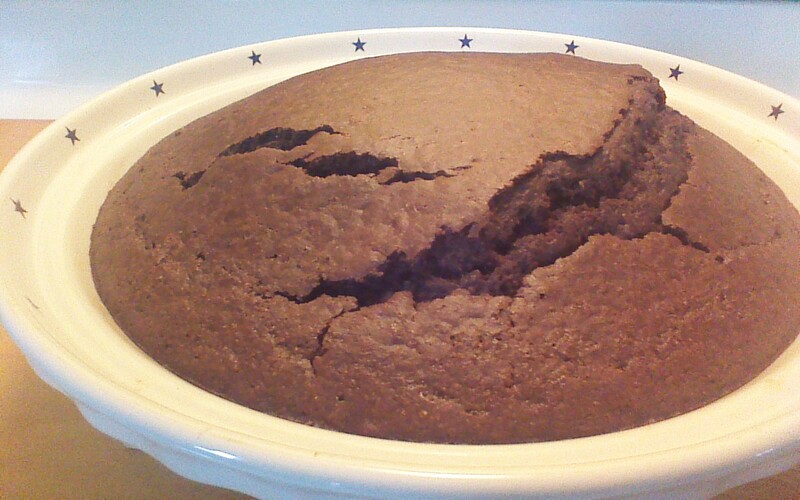 I was in the mood for something a little zippy with my coffee this morning, so I made us some Cocoa Chile Cornbread. 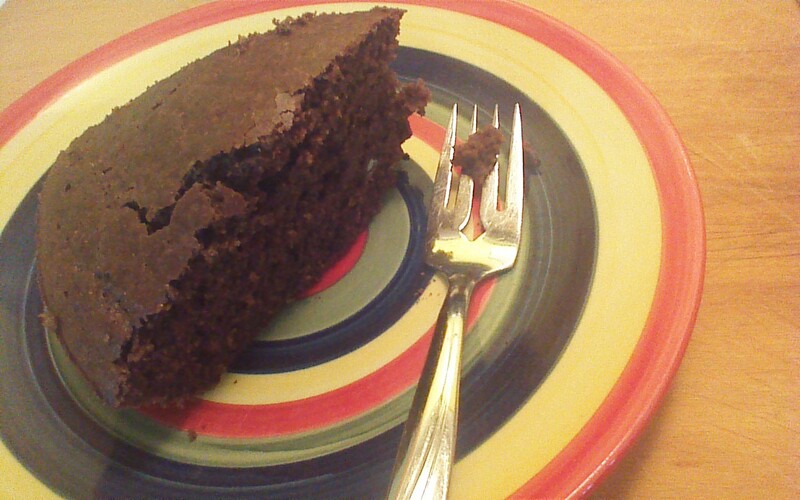 While it looks like chocolate cake, it actually offers a flavor combination more suited to enchilada sauce than frosting. Cornmeal offers texture, cocoa powder offers warmth, and a whole, ground Ancho chile offers just enough heat to let you know you’re enjoying something special. Ole! Step 1) If your Ancho chile has a woody stem, remove the stem. Then, taste one of the seeds. Every pepper is unique! If the seed is too hot for your liking, remove the seeds from the chile. If the seeds taste agreeable to you, use the whole chile. 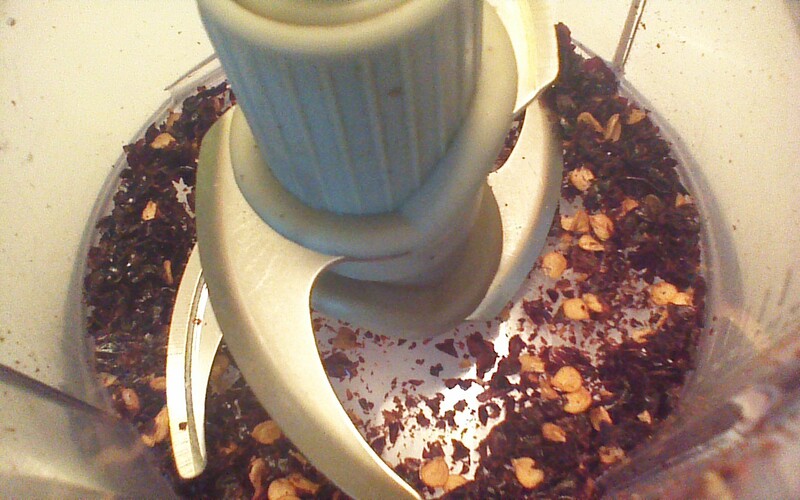 With or without seeds, grind up the chile in a small blender or food processor. 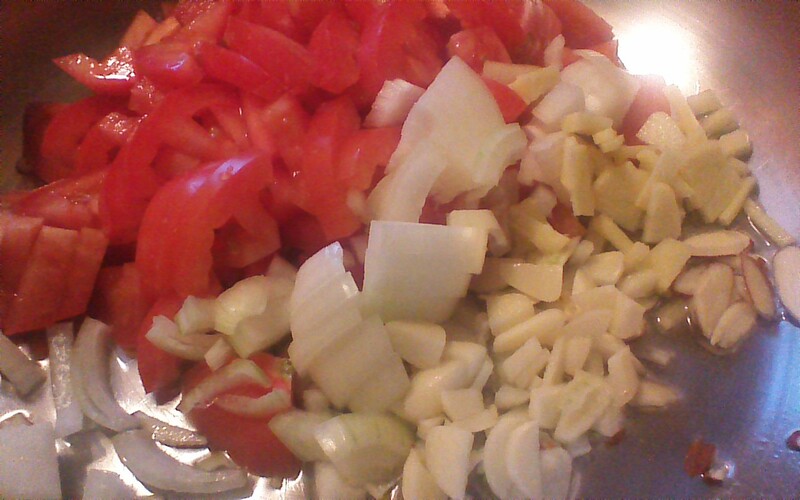 Step 2) Combine all dry ingredients, including ground chile, in a large bowl. Step 3) Add milk, oil, and eggs to dry ingredients and mix well. Step 4) Pour batter into a greased, 9 inch pie dish. Bake in a preheated, 400 degree oven for 25 minutes.